Project Morpheus Tether Test 8 took place at Building 18 - Antenna Range, Johnson Space Center. Image date: March 13, 2012. NASA is looking for innovative new ideas for robotic missions to the moon, and the space agency hopes private spaceflight companies may have the right stuff to help out. This month, the space agency rolled out its new Lunar Cargo Transportation and Landing by Soft Touchdown initiative (dubbed Lunar CATALYST for short) to give private companies a chance to develop robotic moon landers with help from NASA. While the space agency won't provide any funding for the commercial projects, private companies selected for the program will have access to a range of NASA perks. Lunar CATALYST is expected to help support lunar landing development for commercial purposes — like moon mining — while potentially helping out with new science and technology advancement in the process, NASA officials said. The lunar missions could also serve as a stepping-stone for getting into deeper destinations in space like Mars sometime in the future, Crusan said. Private companies have already shown interest in participating in the new initiative. More than 50 entities called in to a conference call describing the potential new partnership. "We see considerable interest from the private sector, and we're looking forward to their proposals," Crusan said. NASA officials expect that there will be multiple teams chosen for partnerships, however, that number hinges upon how much support and resources the partners would require. 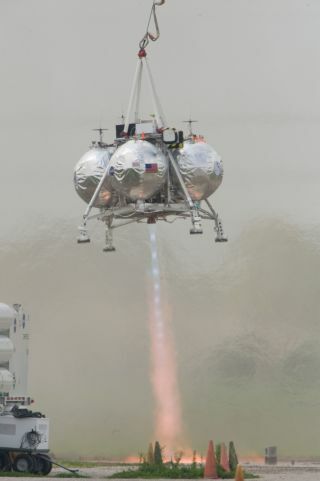 Companies chosen to participate could have access to NASA's Mighty Eagle and the agency's Morpheus lander — two prototype landers that could be launched to explore the moon or other cosmic objects. Google has already launched a race to the moon for private companies with its $30 million Google Lunar X Prize. To win that contest, competitors must send a robot to the moon, move it 1,640 feet (500 meters) and relay data, video and images back to Earth. Companies hoping to compete in for the prize need to be ready to launch by Dec. 31, 2015. Competing for the X Prize does not eliminate a company from participation in the Lunar CATALYST partnership but the goals for the initiative are different. "What we really want to do is enable a robust private sector capability and not just have it reside within the U.S. government," Crusan said. "It's one thing for NASA to do it once, but it's a whole other thing to build upon and build an entire ecosystem of suppliers out there." This initiative is not a new kind of partnership for NASA. The space agency is currently working with private companies under the Commercial Crew Program — aimed at developing a means of sending astronauts from the United States into low-Earth orbit using privately built spacecraft.